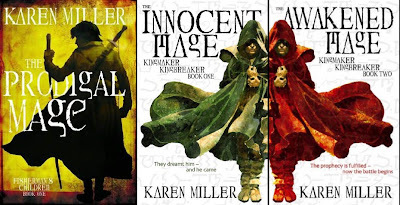 Karen Miller broke into the fantasy genre with her best-selling Kingmaker, Kingbreak duology consisting of The Innocent Mage and The Awakened Mage as well as the Godspeaker Trilogy, Rouge Agents series, a couple Star Wars novels, and a Stargate book to boot. This August will see her 11th released that will also be her hardcover debut with The Prodigal Mage(see review here), which takes place years after the events of Kingmaker, Kingbreak. Read below for some good snippets about what is instore. MH: Hello Karen, welcome to Mad Hatter’s Bookshelf. Thank you for taking time to answer our questions. Firstly, can you tell us a little about yourself? KM: Thank you very much for asking the questions! It’s always fun to chat about writing. And it’s great that you love books so much and give writers and readers this chance to connect. As for a little about me, well … by birth I’m Canadian but I’ve lived most of my life in Australia. I live in Sydney and write full time, which for right now is pretty much all the hours in the day and quite a few in the night as well! Crazy work load, all my own fault. When I’m not pounding a keyboard I enjoy working with my local theatre, mainly as a director. Not doing a show this year though, since I’ve been too flat out. I also love film and tv and unwind watching dvds of my favourite dramas. And I travel as often as I can because I love gadding about the world. MH: For those who haven’t dipped their toes into the world of Asher and Daphne, what would you say to prospective readers to whet their appetite? 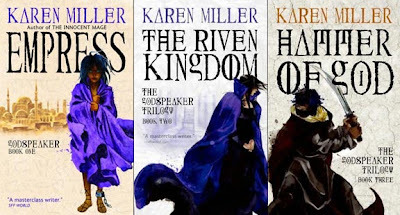 KM: I’d say that if you enjoy traditional fantasy that’s character driven, with themes of love and loyalty and sacrifice and betrayal, with a dollop of humour and a few bucketloads of angst and drama, then you might well enjoy the Kingmaker, Kingbreaker duology. It’s not a huge, epic kind of fantasy tale ranging over many many lands with a massive cast – it’s quite intimate, and very focused on a small group of people and their lives, their friendships and feuds, and how many so other lives are affected by the actions of a few significant people in key places. MH: What is over the Wall? KM: Ha! You’ll need to read The Prodigal Mage to get an answer to that question. *g* MH: Do we get to learn more about the magical history of Asher's people? And of Gar’s ancestors? KM: That is certainly touched upon, but I wouldn’t say those issues are the focal point of the stories. At least not in the two-part sequel, Fisherman’s Children. I’m also doing a standalone prequel, and some of those questions will be addressed there. MH: Could a person who hasn’t read Kingmaker, Kingbreaker jump into The Prodigal Mage or would you recommend they start with the former? KM Well, they could, of course, but given there are some pretty massive things that happen at the end of Kingmaker, Kingbreaker that are openly spoiled in Prodigal Mage, I’d have to say it’s probably best to read the series in order. MH: What was the moment you felt you had made it as an author? KM: I can’t honestly say I do feel that I’ve made it. I mean, yes, there’s the indescribable elation of being offered that first contract. And then seeing the book in your hands. And then being asked to come back and tell more stories. Getting taken to an inernational level, as I’ve been with Orbit. But I find that the more I do, the more books I write, the more I realise how much I have yet to learn about this storytelling game. I’ve been massively lucky in that the reading public seems to be enjoying my work, but this is a precarious business. I’m afraid that if ever I let myself believe ‘oh, I’ve made it’ then I’ll stop trying to do better, I’ll get complacent, and thereby betray the trust so many readers have put in me. So I’m always looking for the next challenge, to keep myself working hard and learning and growing as a writer. MH: What has it been like being involved in the Star Wars Universe? KM: Truly fantastic. Before ever I was a writer, I was a fan of stories, and a huge Star Wars fan in particular. Fell in love with that story when I was still in high school and saw the original Star Wars film when it was first released. Changed my life. I still find it hard to believe that I’m now writing stories in the galaxy far, far away. It’s an enormous privilege. That means I feel a bit of pressure, too, but it’s a good kind of pressure. I’m aware that not every fan is going to enjoy my take on Star Wars, or want to read the heavily character-driven stories that I write, but I’m okay with that. It’s a big tapestry and there are a lot of different ways of telling a story. The fans who have enjoyed my first Star Wars novel, Wild Space, have been wonderfully supportive and enthusiastic, and I can’t tell you how much that means to me. I’ve just finished the second one, and I’m gearing up to write its sequel, and I’m having so much fun it shouldn’t be legal. I owe the people at Del Rey and Lucasfilm – and Karen Traviss, who helped me get the gig – a huge debt of gratitude for the chance to do this. MH: Have you had an idea for the Star Wars book you felt you couldn't get away with? If so what? KM: Actually no. Insofar as I’ve introduced an element into the next two novels I’m doing, that I thought Lucasfilm and Del Rey might not approve of, but they have. So I’m very pleased! It might prove to be a bit of a pot-stirrer for fandom, but I guess I’ll have to wait and see. As for giving out the details, sorry. No can do. I’d love to tease you, but I have to stay very, very guarded. MH: What has been your favorite book to write so far? KM: Oh, that’s almost impossible to answer. I mean, for the Pinch Me Is This Really My Life? factor it has to be Star Wars. For sheer fun, it’s the Rogue Agent series under my pen name K E Mills. For pushing myself beyond what I thought I could do, it’s Empress, the first book of the Godspeaker Trilogy. For realising just how much I love a group of characters and how much I want them to be happy, even when that’s getting harder and harder, it’s The Prodigal Mage. Each book brings with it its own challenges and its own rewards. I will say, though, that for simply entertaining myself, playing with the cast of characters in the Rogue Agent series is the most amazing way to spend my time. I don’t know where they come from, and I don’t understand where the lines come from, but they open their mouths and start talking and I’m just along for the ride. It’s crazy, in a good way! MH: You seem to be able to write books incredibly quickly. What is your regiment like? How do you keep yourself motivated? KM: Deadlines are remarkable motivators, you’d be surprised. *g* Seriously, right now I have to keep my head down and write lots because I managed to load myself down with a lot of projects. It’s not ideal, insofar as a writer does need to see more of the world than the post office and the supermarket, which are pretty much the only two places I get to these days! That’ll change next year, and then I’ll never be quite so busy again. If I can help it. Because of the workload right now, really, I just write 7 days a week, for as long as I can every day. I try to squeeze in a down day every now to clear my brain, but right now my life is story, story, and then some more story. Not that I’m complaining. I am beyond privileged to be doing this, and I love it so much it scares me. But even when things ease off I’ll always keep myself busy with something because I’m not really one for lazing about. I’ve got to be doing something, creating something. I like to be on the go. I get bored easily. MH: Do you listen to music while you write? If so what? KM: I do. I listen to film and some tv soundtracks, because that kind of music has been written specifically to access the emotions and I write to access and explore emotions, so they’re a good fit. I really enjoy writing to the music of Hans Zimmer, Bear McCreary, John Williams, Phillip Glass, James Horner, Alan Silvestri. Just to name a few! MH: You've done character-driven Epic Fantasy (Kingmaker), Humorous Fantasy (Rogue Agent), and Historical Epic (Godspeaker) what are you going to try next? KM: Well, I have to be a bit cagey because nothing’s been contracted, but I do have in mind a larger, more epicy epic fantasy series spanning a lot of different cultures and countries, with far more scope than I’ve attempted before. See what I mean about always having to challenge myself? *g* Frankly the idea scares the moxy out of me, which is why I really want to do it. Big story, many characters, many story threads. The most ambitious thing I’ve ever dreamed up. Horrifying but exciting. So we’ll have to see. Plus I’m looking to pitch more books in the Rogue Agent series because I adore that world to pieces. And there are many stories to tell. MH: Have you any plans for a sci-fi book outside of established properties such as Star Wars and Stargate? KM: I wouldn’t actually call Stargate and Star Wars science fiction. Not in the strictly classic sense of the genre. I love them, but there’s an awful lot of handwaving going on when it comes to the science part of the equation. And that’s fine by me! I’ve only ever dreamed up one SF story idea, which I tried to pin down as a short piece while I was at Clarion. See, the thing is, if you want to write SF you really should have a clue about science, and I bailed on science when I hit valencies in high school. But it’s a story that still interests me and one day I might get around to telling it. MH: Can you share with us the title to the 2nd Fishman's Children volume and when it is expected to be released? KM: The sequel to The Prodigal Mage is called The Reluctant Mage and it’ll be out next year. Right now I’m fuzzy on actual publishing dates – I’m too busy writing and if I think too hard about actual street dates I freak myself out and that’s not a good thing! MH: On your site you mention there will be a total of 5 books in Asher’s world, but I heard there will only be 2 Fisherman’s Children books. Will there now be 3 or is the last after the events of Fisherman? KM: No, the final book, A Blight of Mages, is a standalone prequel. It will tell the story of Morgan and Barl, and how the whole ugly avalanche got started. I’m really looking forward to getting my teeth into that one. Let’s just say that what folk believe happened isn’t necessarily the way it all went down … *g* MH: What Fantasy/Sci-fi author do you think deserves more attention? KM: I’ll give you one of each. 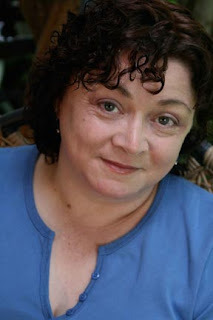 For fantasy, you can’t go past my fellow Voyager/Orbit author Glenda Larke. Glenda is one of the best worldbuilders in fantasy, full stop. She has lived a truly extraordinary life and her experiences and unique perspectives show in every page of her books. And for SF, I have to say Kage Baker. I cannot understand why Kage isn’t celebrated as a national treasure. Her incredibly thought-provoking Company series is some of the best SF out there right now. She’s amazing. Everyone should read her. MH: If you could be any character from any fantasy book who would it be and why? KM: Arwen, because who wouldn’t want to end up married to Aragorn? MH: What are 2 things most people don’t know about you? Do you have a pet monkey you keep sequestered in the backyard? KM: Well, okay. I know how to prepare a stable for a visit by the queen, and I once helped to embalm a dead body. MH: Is there anything else you’d like to say? KM: Just that I am so very, very grateful to the readers out there who have taken a chance on my stories. Books aren’t cheap, I know. And time is a scarce commodity these days. So thank you for trusting me. And thank you for writing to tell me that I haven’t wasted your money or your time. I truly appreciate it. Thank you for reading. Stories make the world go round, at least they make my world go round, and it’s so cool to know I’m not spinning on my own. MH: Thank you for your time. KM: Thank you!!!! Your layout is quite nice...love the Mad Hatter reference! Check out our website if you get a chance, we have mad hatter t-shirts we designed haha.